Paddy Power Casino offers to their players a gaming experience that is of the highest quality. It is available to you in three formats which are as download, flash and mobile. The casino offeres several popular games developed by such software giants like IGT, Playtech, Wagerworks and others. It has a license from the Alderney Gambling Control Commission, and Cogra certified, to make sure that you are in very capable and secure hands. Paddy Power has in store for their players an extensive collection of games. A large part of their game repertoire comprises of the best and latest video slots, such as the Marvel comics, Incredible Hulk, Iron Man 2 as well as Gladiator Jackpot. Apart from these, Paddy Power Casino maintains its own range of exclusive and unique games. Paddy Power provides their gamers with the very latest and exclusive table games such as different variations of Blackjack, Baccarat, Roulette, Craps, Sic Bo, Casino Hold’em, Red Dog, and many more. If you are a video poker enthusiast, you have an excellent choice of games at your disposal, and these include Jacks or Better, Aces and Faces, Pick’em poker, Joker Poker, Deuces Wild, and others. Paddy Power also has a leisure section for the gamblers. This section offers them several special games like Keno, Pop Bingo, Iron Man, Genie’s Hi-Lo, and the like. 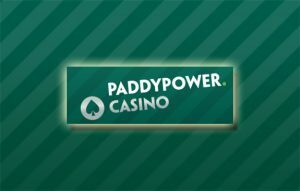 Paddy Power welcomes their players with a 100% welc ome bonus with a maximum capping of €300, while the minimum amount you need to deposit is €5. As for the wagering requirements, they are 20 times that of the deposit as well as the bonus. You should fulfill the wagering requirements within seven days or your money will be forfeited. However, it is not necessary to claim your bonus when you open your account, but unless you do it within 30 days, the bonus will be forfeited. Only slots are considered to the full towards bonus requirements such as Stravaganza, all the variations of Pai Gow, while Let It Ride and Red Dog account for 20%, and other listed games count for only five percent. Games such as video poker and blackjack count for nothing. Paddy Power has laid down some other conditions too: bets placed while playing roulette can cover up to 75% of the numbers, meaning wagering on black and red is null and void. The Paddy Power Casino lets you play a lot of games using every mobile device like mobile phones, phablet and tablets. Users of Android, Windows and iOS can access the games via their mobile device browsers as well as several downloadable Apps. With Paddy Power, you can make use of all the usual methods of depositing cash. Withdrawals are prompt, and it takes an average of 12 hours to seven days to make withdrawals, according to the payment method you have chosen. However, deposits made through Skrill and Neteller do not count towards welcome bonuses. Paddy Power offers excellent customer support to all their users on a 24/7 basis. Several contact options are available. They can take advantage of Paddy Power’s live chat service available 24×7. The players can also communicate with the supporting staff by phone, email, and fax. Their website has effective FAQ sections to answer the more common asked questions by players easily and quickly. Security can be a problem while making online cash transfers. To counter this, the casino has security systems in place to protect the personal details of every player. These systems are tested scrupulously as they are equipped with the very latest in SSL encryption. All banking details as well as transactions are under the protection of firewalls.